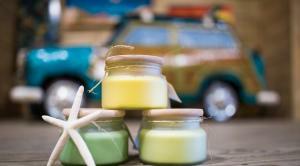 This shop features a charming collection of salvaged seaside-themed home goods and gifts, as well as products from the Dixie Belle Paint Company, Dinah's go-to brand of waxes, stains and colors. 19605 Panama City Beach Pkwy. Rather than sifting through shelves of mismatched items, find a collection of new and used furniture, appliances, and recreational equipment geared specifically toward the beach lover. 17900 Panama City Beach Pkwy. This shop provides all the variety a flea market has to offer, without the hassle. While browsing through the shop’s 22 vendor booths, you’ll find a uniquely curated combination of home décor, furnishings, glassware and jewelry. 17756 Panama City Beach Pkwy. If you’re looking to bring that beachside bungalow vibe to your home, the Coastal Cottage Emporium stocks its space with distressed, repurposed fittings, pastel pops of color and nautical antiques. 17203 Panama City Beach Pkwy. Whether you are shopping for furniture, home decor, interior design, or jewelry and accessories, 13 Hub Lane has something fabulous just for you! Distressed woodwork, decorative beach signs and sculptures will bring the serenity of the seashore to any room in the house. A trove of local art, artisan-crafted curiosities and collectibles, Turtle Girls Market features masterpieces inspired by our emerald-green waters. 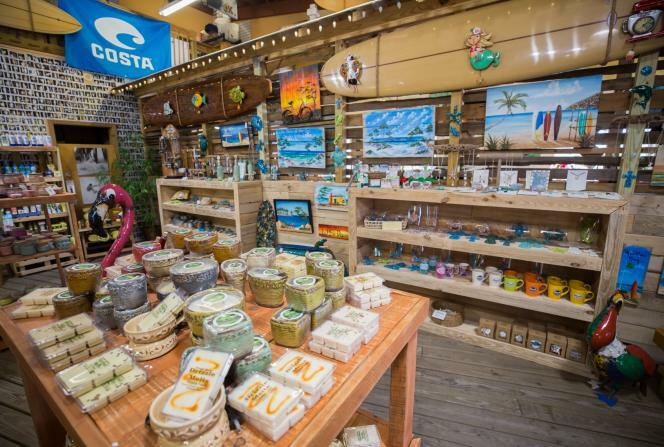 Inside Mr. Surf’s gift shop lies dozens of purchasable paintings, ceramics and accessories from local artists. These one-of-a-kind pieces add PCB panache to your beach home or condo. Treat yourself to a selection of oceanic ornamentations for your home, but this is also the place to go for those looking to sharpen up their toolbox. Like a true garage sale, you never know what kind of knick-knacks and novelties await. With over 20 vendors that hail from all over the country, each week brings a brand-new shipment of “shabby-chic” antiques and beachy baubles to The Shadow Box. With its conglomeration of enchanting shells, alabaster driftwood and antique goods from 22 talented vendors, Pieces on the Beach is the epitome of coastal-chic. This is the perfect stop for timeless home furnishings with casual coastal elegance. As if you needed another reason to visit Panama City Beach Florida, not only are the sugar white beaches to die for, and tons of fun activities, but now you can shop for the cutest shabby chic decor and coastal furnishings. 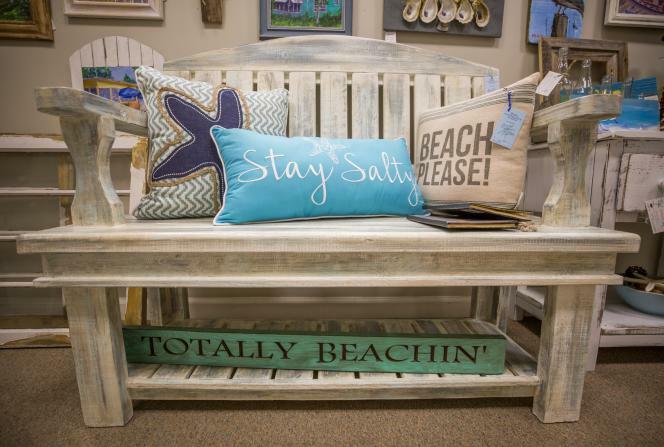 Visit the Coastal Design Emporium Trail to bring the laid back Panama City Beach vibe to your own home. 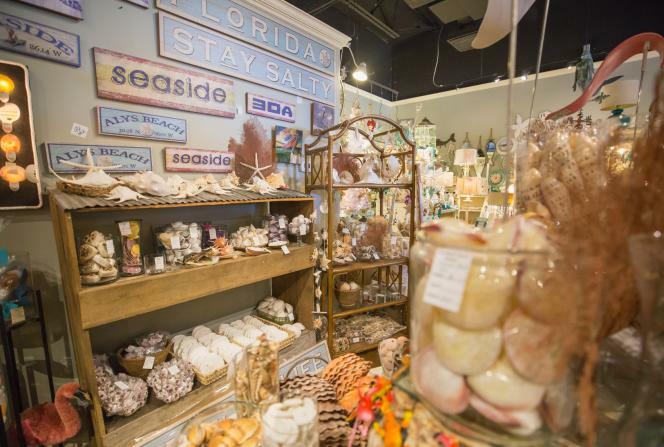 We&apos;ve lined up some of the most charming locally loved shops in Panama City Beach, the kind you can spend the whole day discovering tempting treasures with that irresistible beach vibe. Grab your Decor by the Shore passport (available at participating stores and the Visitor Center) and set out for a unique shopping adventure you won&apos;t find anywhere else in the world. Get your passport stamped at each stop, then drop by the Visitor Center for a special souvenir. If you are looking for quality new or used furniture, Back Beach Thrift & Coastal Furnishings is your next stop. There’s nothing like finding that special piece of furniture that has character and personality and fits your style. Next, you should wander down to Beach House Market. They have 22 booths that specialize in adorable shabby chic home decor, including mermaid and nautical themed accessories, rugs, lamps and even jewelry. Make sure you don’t miss Coastal Cottage Emporium for beautifully distressed furniture, consignment items and antiques. Whatever you need to brighten up and “beachify” your home, they’ll have exactly what you want. Keep your shopping excursion going towards the west end of Panama City Beach Parkway where you’ll find 13 Hub Lane. This charming retail space is full of upscale and contemporary pieces offering an elegant approach to your seaside vision. Just a four-minute drive away is Avenue Sea in Pier Park where seashells and rugged nautical ropes are elevated to visually pleasing heights. Whether you’re piecing together a perennial tablescape or seeking seasonal items to align with your theme, Avenue Sea has the furniture and accessories to pull it all together. Next, take a little detour towards Front Beach Road and stop by Beach Bums Decor located in the Shoppes at Edgewater off of Richard Jackson Boulevard. Specializing in coastal style furniture, as well as repurposed and reclaimed items, you are sure to find a one-of-a-kind piece to complete your shabby chic look. Keep going along Front Beach Road to reach Turtle Girls Market. There you will find an eclectic collection of artisan-crafted collectibles, local art and coastal home decor. Heading south to Thomas Drive, you must stop by the Artist’s Space at Mr. Surf’s. Inside Panama City Beach’s infamous surf shop, Mr. Surf’s Artist’s Space boasts local arts and crafts in the coastal style. You will find dozens of paintings, ceramics and accessories all available for purchase. If thrift stores are your thing, you can’t miss the Great American Garage Sale. They have a variety of furniture, antiques and knick-knacks that are perfect for that beach house look. 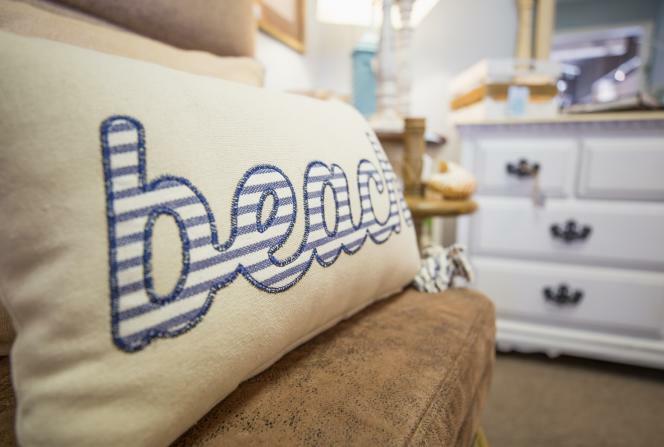 At Pieces on the Beach, with over 5,500 square feet and 28 vendors, you are sure to find the best in coastal and shabby chic furniture, decor and local art. There’s always something new everyday. 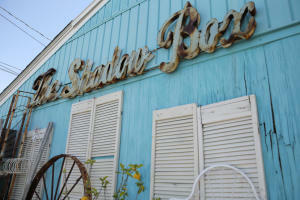 Your last stop on Thomas Drive should be Shadow Box, “where shabby meets chic”. If you want true inspiration, this is the place. 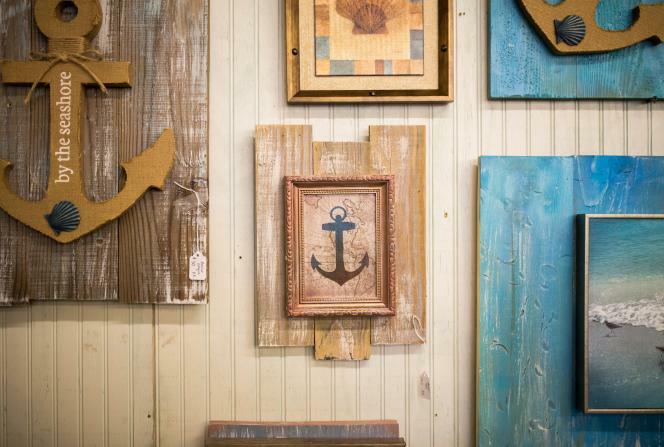 The Shadow Box specializes in whimsical, one-of-a-kind items, coastal decor, jewelry and even repurposed pieces. 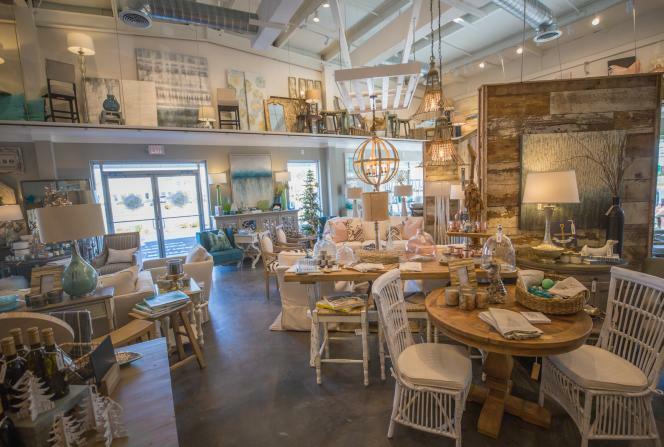 When planning a trip to Panama City Beach, make sure you spend at least a day perusing unique coastal style furniture and home decor at Coastal Design Emporium Trail. It will feel like you’ve struck gold once you’ve found that perfect item to add to a beach house, condo or even a beach-themed room. You can even pick up gifts for friends and family so they can have a piece of PCB as well. The Decor by the Shore Trail makes it easy and fun to indulge in shabby chic style.